I'll be 45 tomorrow. I'm neither anticipating it nor dreading it. Chances are it will resemble one of the 16,435 previous days I've spent on this Earth. Some days have been filled with love, some with anger, some with gratitude, some with envy, some with pride, some with shame, some with selflessness, some with selfishness, some with hope, some with fear. It's a day like any other day. Yet I know that memories always come flooding back on ''the day''. Great ones, good ones, ok ones, not so good ones. And I have to recognise the day. For the sake of my parents and my Kiddo more than anything. I think, and I'm hopeful, that it meant/means something pretty awesome to them. 'Cos I'm here for them, right? I think I remember getting a brown toy poodle called Frisette on my birthday. I was maybe 4? But I may just be remembering the pictures I've seen. Or was it our little white Candy? I'm not sure. I remember we had two toy poodles, one white, one brown, and one of them I got on my birthday ... that much I know. Either way, I know it was a great birthday. I vaguely remember an expat birthday party at TropiBurger in Maracaibo with my parents when I was about 8, wishing it could have been McDonald's, where Ronald McD and the Hamburgler themselves might have made an appearance and no one would have ever considered putting mayo on a burger. 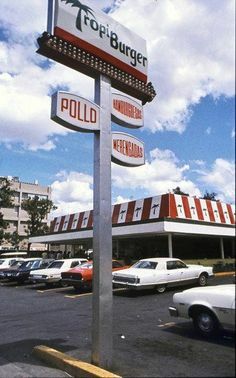 That was back in the 70's, in the days when I was an expat kid and before Mickie D's was a global conglomerate. I was pretty spoiled. It was a good birthday. I remember my first birthday as a repatriate in Canada; my mom did her best to get as many people around the table as she could ... she served up a feast of spaghetti and all my cousins (around 40 or so), and aunts and uncles came and sang happy birthday and just hung out. My mom really tried. She did the best she could to make the day special. Except that my dad wasn't there. He was still in Venezuela. She couldn't do much about that. Despite her best efforts. My cousins and I snuck out after the cake was cut to sneak a cigarette in the woods. The day was ok. I remember my first birthday with my ex-husband. I was 17. We'd been going out for a few months. He couldn't afford to get me anything; he'd just bought a new car. I was sooooo cool with it; ''no problem''. He was, after all, just starting a job, trying to make ends meet. Then he showed up in his little red Firefly on my B'day excited as hell about the new white and royal blue striped seat covers he'd found at Canadian Tire. I tried so hard to be truly happy for him; to acknowledge that he'd come far enough in life that he could pay himself a pair of 49$ nylon seat covers. I tried so hard to convince myself that those seat covers would serve a purpose and that they were worth more than the tiniest token of recognition to me on my day. It was a crap birthday. 28 years later, I'm ready to admit that pissed me off. AND I'm ready to admit I was a pretty stupid 17-year-old; I can only pray my Kiddo will never be stupid enough to fake happiness at someone buying themselves a gift for HER birthday. THAT realisation makes me happy ... the realisation that I deserve something good, something all about me, and that my daughter does too. I also realise that I actually played a part in letting the days and the birthdays grow progressively worse, and that I've worked pretty hard over the last few years to make them better. That having been said ... I'll be 45 tomorrow. And I feel I have to say it's not the birthdays that have marked my life. It's every other day. It's the moments in between the birthdays that have made the difference. Like the memory I have of walking back from pre-school with my mom through the apple orchard in Burlington, Ontario. Of sitting under an apple tree and making a picnic out of what was left of my lunch. I don't have a picture of that ... other than the one in my mind. I was probably five. I think that's my best memory ever. Like the memory I have of my brother bringing me to the ''Smoke Shop'' at Tyandaga Mall and letting me fill a paper bag with Dubble Bubble gum, Popeye cigarettes, liquorice cigars, Sour Chews, and Jaw Breakers. Like the memory I have of breaking down a week into my first year of uni, of calling my dad crying, and of having him tell me to stop worrying. ''You don't have to stick it out, come stay with me for a year; you can work for me, and you don't have to worry about a thing.'' Never has a phrase uttered been so simultaneously reassuring, terrifying and motivating. Like the memory I have of Smilin' Vic coming to visit when I was a singleton. Of him installing all the cable for my surround sound and putting up window weatherization plastic in my breezy old attic apartment. There are a multitude of tiny little amazing moments that have made up my life. But I don't think a single one of those life-changing moments has happened on my birthday. Ever. My birthdays have mostly been about indulgence and excess. Too many people, too much food, too much cake, too much drink, too much focus on me. The amazing moments in between are the ones that have really made the difference. Silly things like buying matching pj pants for our vacation. Little things like watching ''Call the Midwife'' with Smilin' Vic and Kiddo. Little things like skiing a black piste for the first time at the age of 44. Little things like starting a blog and sticking to it. Little things like just being happy with where I am today, no matter whether today is my birthday or any other day. Matching pj bottoms make vacations WAYYYYY cool. Tomorrow's my birthday. I hope it's a great day. 'Cos I'm working on making every day a great day.